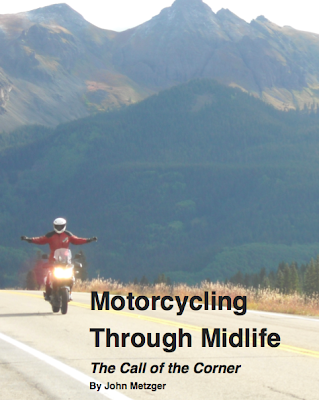 Motorcycling Through Midlife, The Call of the Corner is best read the way one attacks a good motorcycling road: finding the rhythm, settling into a pace, feeling the flow from turn to turn, and reveling in sudden changes in direction and elevation. Thorough reviews can be found here, and here. 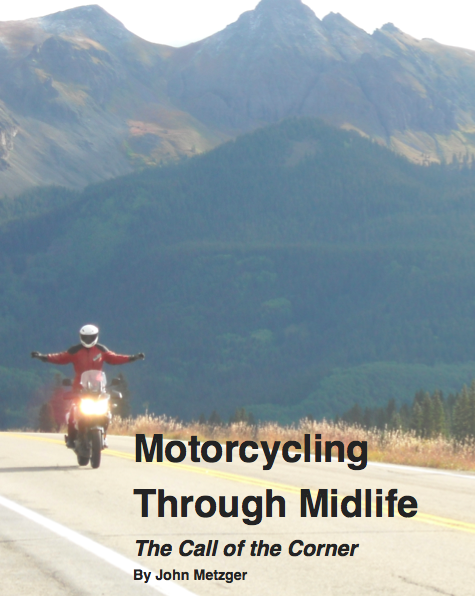 “I wrote this book for my fellow baby boomers who are thinking about taking up motorcycling, or already have,” said Metzger, who is also the founder of Motomarathon, about which I've posted a few times before. “Though it’s a dangerous hobby fueled by subconscious adolescent cravings, motorcycling can be the finest expression of youthful joy and freedom if approached with the wisdom of midlife– and before we get too old.” While I came into motorcycling from a totally different direction as the author, and while I don't agree with a number of his opinions, I found much to like, to chuckle over, and ponder. I was wishing for higher quality, color photographs as well. Being a slim book, the ride was over all too soon, much as journeys down fun roads always seem to be. I recommend this book for any rider's motorcycling library.